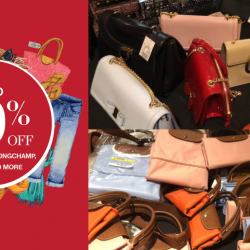 4 - 5 Dec 2018 The Fashion Gallery: Luxury Fashion Family & Friends Sale with Up to 70% OFF Coach, Furla, Moschino, Diesel, Versace & More! Indulge and shop at The Fashion Gallery Luxury Fashion Family & Friends Sale with up to 70% off on bags, shoes, accessories & apparel! Plus, American Express Cardholders and Changi Rewards members get additional 3% off total bill. Terms & conditions apply. 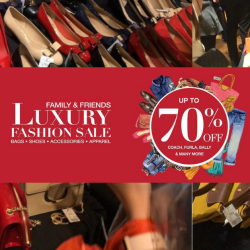 18 - 20 Oct 2018 The Fashion Gallery: Family & Friends Luxury Fashion Sale with Up to 70% OFF Luxury Products from Coach, Furla, Longchamp, Versace & More! 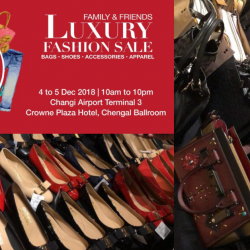 Get set & splurge on The Fashion Gallery's Family & Friends Luxury Fashion Sale with bags, shoes, accessories & apparel. Enjoy up to 70% off on coveted luxury brands! Plus, Standard Chartered Cardholders get additional 3% off total bill.